There are three distinct sides of the illustrious Patek Phillipe watch brand. There’s the elegant and graceful side as illustrated by the Calatrava, Golden Ellipse, and Gondola watches. Then there’s the complex and technical side, as showcased by the Patek Complications and Patek Grand Complications collections. And finally, there’s the sporty side, emphasized by the Aquanaut and Nautilus watches. 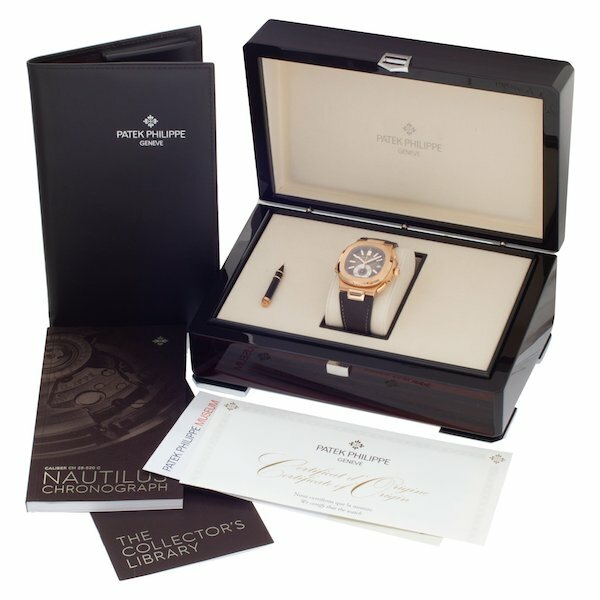 To say that the Patek Nautilus is a popular luxury sports watch is a gross understatement. Alongside Rolex watches, the Patek Philippe Nautilus is the watch that we see most on the wrists of high-profile celebrities, the uber rich, and watch collectors. 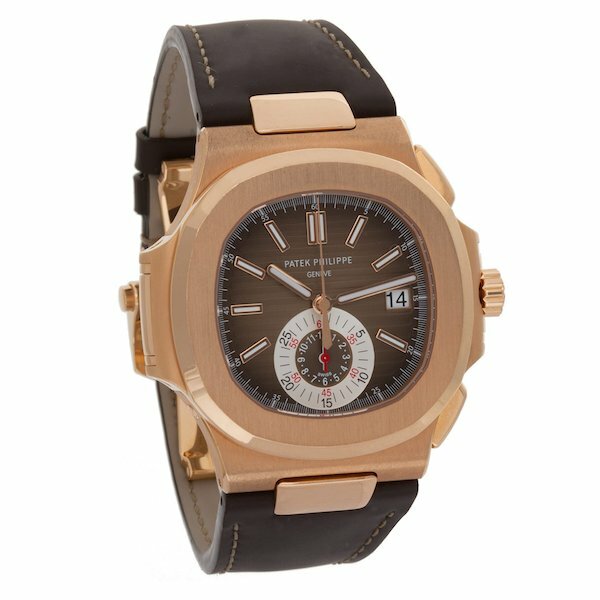 In fact, many will freely admit that the Nautilus is their “Grail Watch.” While there are many versions of Patek’s popular sports watch–the collection is over 40 years old after all–today we’re highlighting the precious rose gold Nautilus 5980R-001 chronograph. In 2016, Patek Philippe unveiled the very first chronograph version of the Nautilus with the 5980. The first model was in stainless steel and houses a blue dial with horizontal grooves–just like the inaugural Nautilus from 1976. However, as a chronograph, the Nautilus 5980’s case was slightly larger at 40.5mm and of course, includes the pair of chronograph pushers on the case, which makes the watch wear even larger. To accommodate the self-winding chronograph movement, the Nautilus 5980 is also slightly thicker (12.2mm) than non-chronograph Nautilus models. It’s important to note that the Nautilus Chronograph 5980 runs on the then-new Caliber CH 28-520 C. This was, in fact, Patek Philippe’s first automatic chronograph movement built entirely in-house. Unlike most other chronograph watches with two or three subdials, the Nautilus Chronograph ref. 5980 only includes one subdial, displaying both the 60-minute and 12-hour counters. There’s also a date window at 3 o’clock, as well as the center hour, minute, and chronograph hands, but no running seconds display. In 2010, the Patek Philippe Nautilus 5980R-001 joined the collection. This time, the 40.5mm case is crafted in precious rose gold, featuring the signature Nautilus porthole style design topped with the customary octogonal bezel. The rose gold Patek Philippe Nautilus ref. 5980R-001 houses a complementary black/brown gradient dial decorated with the familiar horizontal grooves. 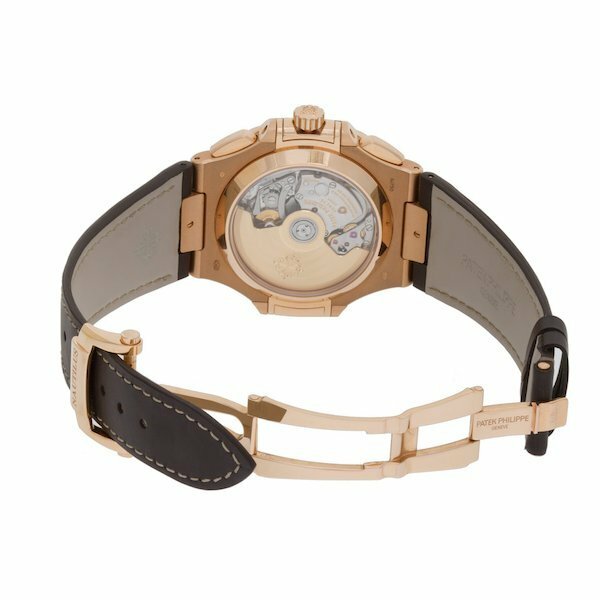 Identical to the steel 5980, the rose gold 5980R-001 includes the monocounter and date window. But to match the rose gold case construction, the applied indexes and center hands are also fashioned from 18k rose gold. Rather than a metal bracelet, the Patek Philippe Nautilus 5980R-001 comes with a dark brown alligator strap. For added security (and preciousness) the leather brand includes a rose gold double foldover deployant clasp. Flip the watch around and you’ll get a full view of the famous Caliber CH 28-520 C movement within, complete with the 21k gold rotor engraved with the Patek Philippe Seal. The watch offers a 45 – 55-hour power reserve and operates at 28 800 beats per hour. 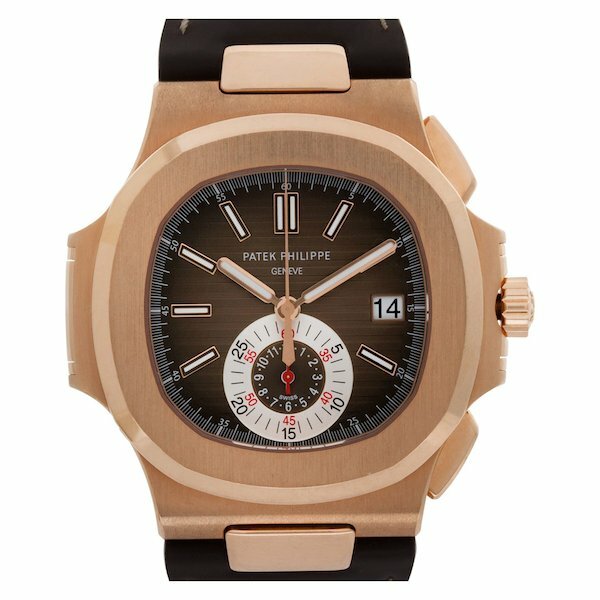 Make no mistake, the rose gold Patek Philippe Nautilus 5980R-001 offers a little bit of everything. There’s the preciousness of the 18k rose gold, the complexity of the automatic chronograph movement, and the sportiness of the Nautilus silhouette. Made by the highly-respected Patek Philippe manufacture, this precious metal Nautilus chronograph proudly flaunts its “grail watch” status.